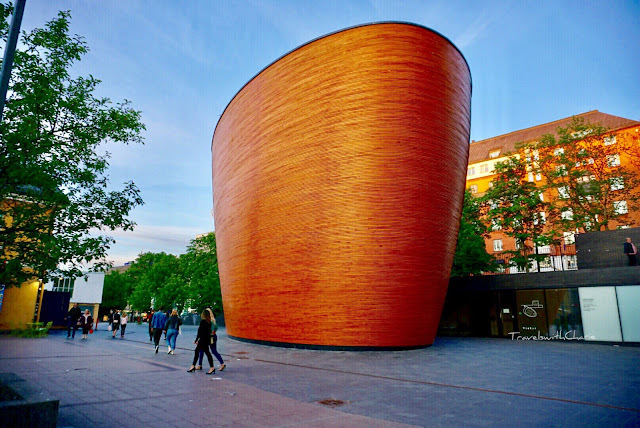 The Kamppi Chapel or the Chapel of Silence is a non-denominational space for calm and reflection. The Chapel maintains a staff who can help anyone unload the cares that infest the mind and body and provides information about the services offered by the Helsinki Parish Union and the Social Services Department of the city. They're open daily. This beautiful wooden structure was designed by K2S Architects Ltd. The curved exterior wall is made from treated spruce wood planks and oiled alder planks line the interior walls. Light pours down the chapel from a skylight above the ceiling. The unadorned chapel is exactly the place to find peace and quiet. Natural light streams into Temppeliaukio or Rock Church through concrete beams anchored on rock and crowned by a copper dome. Temppeliaukio is a Lutheran Church. It is also a venue for concerts. There is a 3 euro entrance fee to the church.